New Delhi: The centre on Tuesday raised the minimum support price (MSP) for wheat, the main winter crop, by Rs110 per quintal to Rs1,735 per quintal. 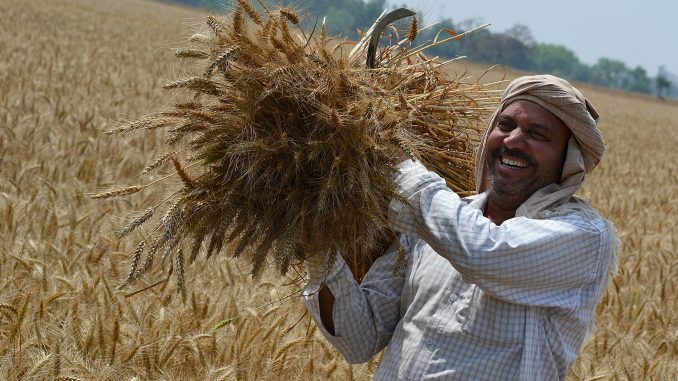 The 6.8% hike over last year’s MSP is the highest in six years for wheat and comes ahead of the rabi planting season in states like Punjab, Madhya Pradesh and Uttar Pradesh. Alongside wheat, the MSP for gram or chickpeas, a major winter pulse, was raised by 10% to Rs4,400 per quintal, while the support price for mustard, a winter oilseed, was raised by 8% from Rs3,700 to Rs4,000 per quintal. The increases come after months of protests by farmers across several states with demands for remunerative crop prices, and after the estimated production of summer (kharif) crops fell 2.8% year-on-year in 2017-18, following an uneven south-west monsoon. Among other winter crops, the centre raised the support price for lentils by 7.6% to Rs4,250 per quintal while the MSP for safflower was hiked by 11% to Rs4,100 per quintal. Sowing of winter crops begins in October and harvesting by next March. “The MSP increase is largely similar to the hike announced last year, although larger than the rise during 2013-14 to 2015-16 (around 4%),” Nomura Research said in a note. It added that in the context of the upcoming elections and reports of farm distress, the hikes are a prudent policy response. “This should keep food price inflation contained in the near term as MSPs typically set the floor for market prices, especially for cereals,” Nomura said.